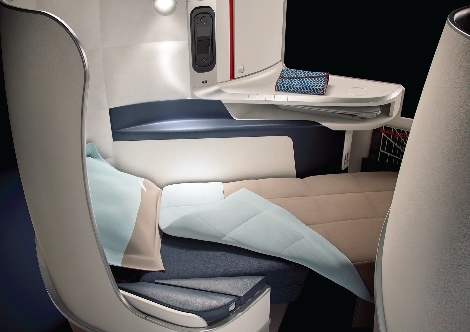 Air France has today revealed details of its new long-haul fully-flat business class seat. As was expected, the seat is the Zodiac Cirrus Aero Seat designed by JPA design and is similar to that adopted by Cathay Pacific and American Airlines. The Air France design was created by designer Mark Collins of Design Investment and by the design and branding agency, Brandimage. 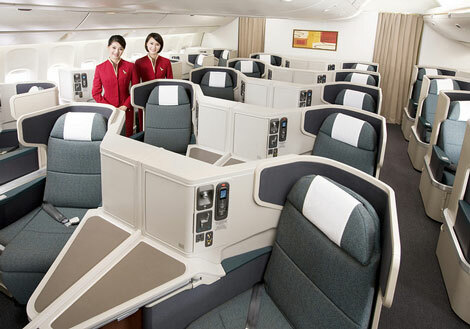 For recent reviews of the Cathay Pacific and American Airlines’ seats, click here. 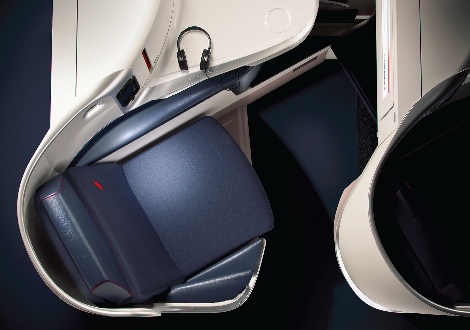 The Air France seat has some slightly different design features from those other airlines. For instance, the IFE screen does not swing out from the side of the seat in front but seems to be fixed into the back of the seat, and so faces the passenger. In addition, the storage areas are slightly different. Air France said the IFE screen of the new seat is 16 inches, and that the concept of the seat has been designed around 3 ‘F’s — fully flat, full access (to the aisle) and full privacy. The seats are in a herringbone angled configuration, which gives all passengers privacy, and the configuration is 1-2-1. 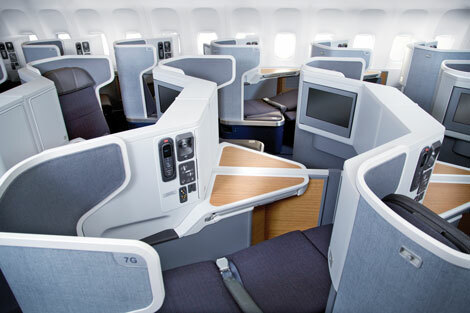 Air France had previously revealed details of its new economy and premium economy seating last year (see news, September 2013) and had mentioned the new business class (see news, September 2012). The airline had said previously that the new seating would allow it “to move upmarket” (see news, June 2013) and had been designed as a result of extensive market research with frequent flyers. Interestingly, it has chosen a different manufacturer from its partner KLM, which is currently installing the B/E Aerospace seat (see news, March 2013), although Skyteam partner Delta does offer this seat in Business Elite. Air France had previously hinted that the seat might be on all its long-haul fleet, but there is no mention of the A380 getting the new seat. Instead, the airline’s press release talks of a total of 2,102 seats on 44 B777 aircraft. Neverthless, other news reports have indicated that in time it will be fitted to the A380, but perhaps only after the B777 fleet has ben refitted. 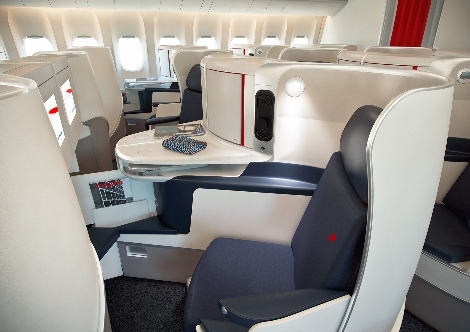 Another fascinating detail is that these seats are removable, and have been designed so that in only two days Air France can reconfigure the cabin of some of its B777 aircraft so that it can increase the amount of economy seating, and descrease the amount of business seating. This is because in the summer business demand goes down, and rather than selling the seats at a discount, when it could more than fill the economy section, Air France will increase that economy section and maintain prices in the business cabin by reducing supply. A delicate-to-the-touch duvet, a XXL feather down pillow. Read an interactive Air France brochure here.